All animals in the rescue are de-sexed prior to rehoming (where possible, due to age) to prevent further breeding. They are also wormed, flea treated, vaccinated & microchipped and have received a health check by a vet. If you would like to meet any of the animals listed please contact me to arrange an appointment. Rehoming is subject to a homecheck and a donation. We are looking for a home for this lovely lady. Spike is 4 years old. 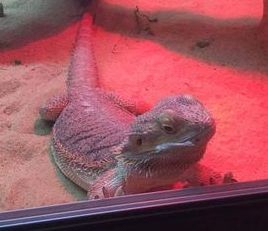 She is a female, bearded dragon although she was named before they knew she was a she! She comes with her enclosure and everything she needs. You must have good reptile knowledge and understand she will need live crickets daily which can be costly. You must also consider that she is in a 4ft by 2ft Vivarium so you will need a lot of room to house her! For further information please message the page. Mi-Mi is approximately 10yrs old. She would like a quiet household with no young children. She would be best as an only dog unless another elderly one. She is totally fine with cats. Mi-Mi is wonderful in every single way apart from her toilet habits. She has been able to pee and poo in the house for the past four years so this habit is very hard to break, chihuahua's are renowned for this. Her owner would have to be fully aware and accepting of this and help her try to break the habit which is why one on one with someone home all day would be better as 100% concentration on her. She does go on a puppy pad most of the time, She is bright and energetic and enjoys a run over the park. 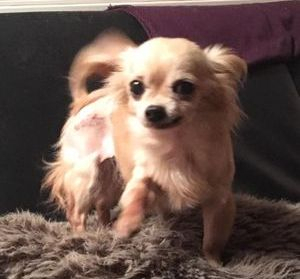 Someone really should give her the chance because she really is a lovely little dog! If you are that special person for her please inbox the page and please share. Home check and donation required!